Paul Heckingbottom was able to reflect on his first victory as Leeds United head coach after the Whites battled to a deserved 1-0 success at home to play-off rivals Brentford at Elland Road. Liam Cooper’s first half header proved enough to end United’s long run without a win that had gone back to Boxing Day and at the same time revived their hopes of a top six finish. Leeds struggled to impose themselves on the game in the early stages, but improved as their confidence grew from opening the scoring and they could have gone on to win more comfortably after a strong second half display. But it was the clean sheet that really pleased Whites boss Heckingbottom. He said: “It’s good to have the first win, it is a reward for the hard work of the players and reward for everyone. “Brentford are a good side and it is excellent to keep the clean sheet. “There are lots of positives to take from the performance. Lots of organisations goes into it and to be successful in this league you have to be able to defend and stop teams as well as hurt teams. “Brentford are great team at creating chances when it goes end to end. “We could have been better at times with the ball, we gave it away too easy at times and could have shown more composure. But we grew as the game went on and deserve that victory. “We stepped up a bit more in the second half and kept them away from our box a bit more. Heckingbottom must have been a little uncomfortable initially as Brentford had the better of the opening half-hour and only a fine save from Felix Wiedwald kept United level as he dived to turn John Egan’s shot wide. Eunan O’Kane saw his shot from outside the box saved by visiting keeper Daniel Bentley while Ollie Watkins sent an effort wide at the other end and Florian Jozefzoon sent a volley over when well placed. It was a surprise when Leeds took the lead just past the half-hour as Ezgjan Alioski swung in a free-kick from the left and Cooper met it well with a glancing header that sent the ball into the bottom corner of the net. It was just the confidence boost the hosts needed and they were more of a force going forward in the second half. 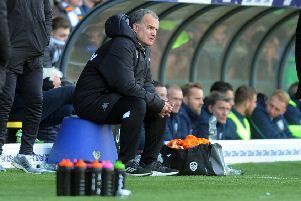 They had strong claims for a penalty turned down when Alioski appeared to be pushed over in the area by Yoann Barbet and felt aggrieved again at referee Oliver Langford when Pierre-Michael Lasogga raced clear only to be pulled back for a free-kick to Leeds after Samuel Saiz, who had put him through, had his shirt pulled. Lasogga had a great chance when turning well in the area only to see his shot cleared near the goal-line by Ryan Woods. Brentford huffed and puffed in a bid to come up with a late equaliser, but United defended well and the visitors were restricted to a half-chance when Neal Maupay volleyed over and an Alan Judge free-kick which was beaten away by Wiedwald. Leeds: Wiedwald, Berardi, Cooper, Jansson, Anita, Phillips, O’Kane, Alioski, Saiz (Vieira 90), Dallas (Sacko 83), Lasogga (Ekuban 73). Brentford: Bentley, Dalsgaard, Egan, Bjelland, Barbet, Mokotjo (Marcondes 69), Woods, Jozefzoon, Sawyers (Judge 69), Watkins (Canos 59), Maupay.